You see a ton of projects on the web where they stick some motors on some sticks, and viola! a quadcopter. Thing is, those motors and full featured flight controllers are expensive. I wanted to try to scratch build a quadcopter from super cheap spare parts from the Syma X5c. Of course I’ve been interested in multirotor aircraft like quadcopters. I am a geek after all! All the things I read about were about advanced hobbyist or professional models, and the price was prohibitive. Then I went to the Northern Virginia Mini Maker Faire, and there were drones everywhere! There was a shop that was selling nano-quads, for $40, and NovaLabs had organized a flying contest using a Syma X5 4 Channel 2.4GHz RC Explorers Quad Copter that can be had for less than $40 on Amazon. When I got home I ordered the X5C version which has a high def camera and comes in under $50. It comes with a battery (you might want to buy extras), transmitter, a charger, extra blades, prop guards and even a micro-sd card for the camera. You’ll need to add AA batteries for the transmitter. Getting started, it is a good idea to use the prop guards especially if you are flying indoors. This aircraft is extremely light, so flying it outdoors is really difficult if there is more than light wind, though once you get the hang of it you can fly it in a breeze. There’s also a button that lets you make it do flips! Be careful not to do it too near the ground or any bystanders, and it works better with the camera removed. I’m going to experiment with unscrewing the camera and affixing it with foam mounting tape to see if the vibrations can be reduced. The camera is also easily removed, if you want more flight time or to do more acrobatics. This quad doesn’t fly itself. My neighbor (Check out his awesome youtube channel on Card Tricks, The Card Cave ) Has a $1500 DJI Phantom 3 Pro. You can tell it to auto take off, return to home, and if you set it to hover somewhere, it stays there, even if the wind is blowing (there are limits, but it’s pretty amazing.) These kinds of copters are enabled with GPS and magnetometers (digital compass) so they can stick to a heading or position, and be programmed to move between them. The video is on a brushless motor gimble that keeps the video rock solid, even when the quad is being buffeted. You can set these fancy copters into “Acro” mode and fly it just like the Syma X5C, but frankly I’d be scared to. Learning to fly. I’m interested in FPV racing and the principles are the same. Learning how to fix a quad copter (cheaply). Every part of this quad is available (either through amazon or one of the chines sites like banggood.com). My son crashed it hard, and it bent the propeller shaft. I ordered a new motor mount for about $2, and I was back in business. I’m even thinking about getting a full set of spare parts (less the camera and body) and trying to scratch build a quad from them. Stay tuned. The Earl Center folks at Wheelock college are doing Bristlebots at the Cambridge Science Festival and I put together a bunch of kits for them. I updated my resource page with updated information about getting the materials and the tools you need. The Boston JCC called me looking for maker activities for an upcoming Hanukkah event, and I thought of this little activity. The copper tape is pretty unreliable though, and it may not be suitable for a big crowd where there may not be time to debug. 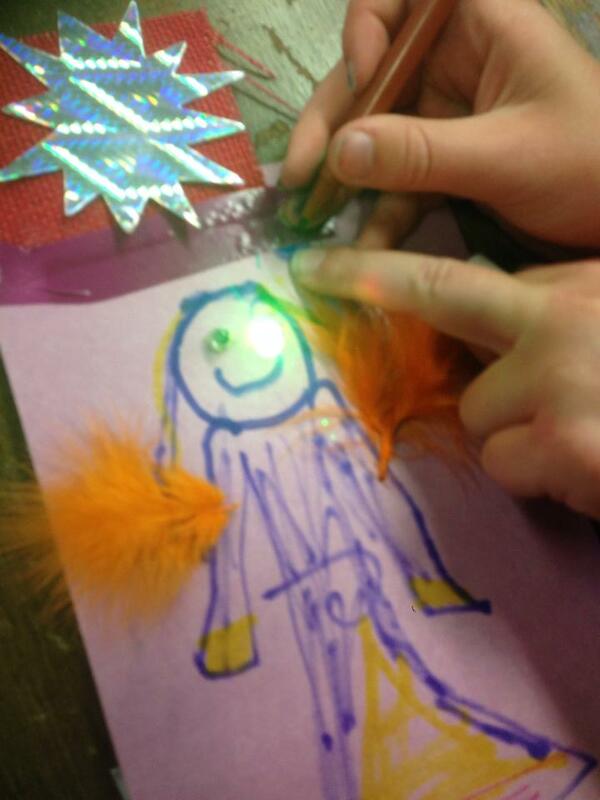 I’d be curious to hear of other people’s experience doing paper circuits and the like. This was working perfectly for a while and then it stopped. I suspect the adhesive (which is supposed to be conductive), just stopped conducting. Perhaps I just need to buy higher quality copper tape? 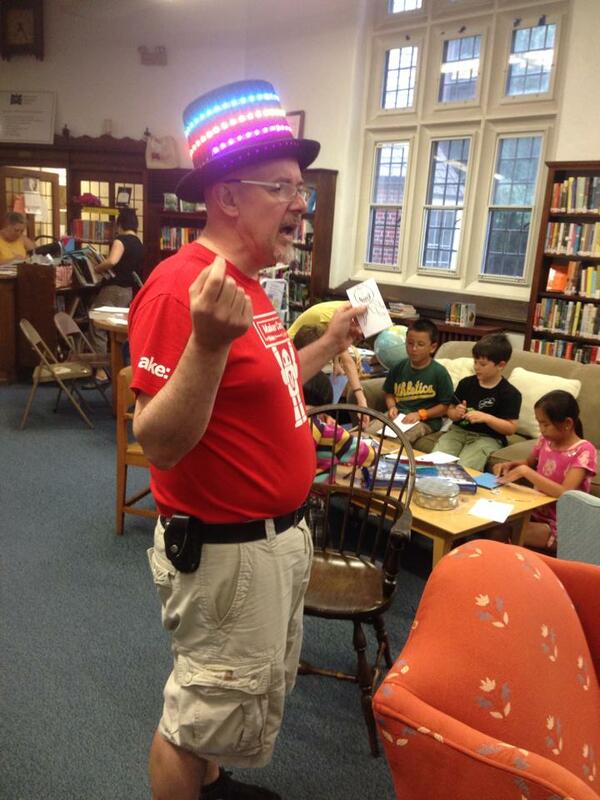 I let the library know that it would be ok for all ages, but if kids were under 7, a parent should stay to help. We got lucky in that we had a couple of parents who either got it right away or picked it up very quickly and they were able to help tremendously. The first I saw this idea was on the MIT High Low Tech site and they have some good pointers. They use surface mount LED’s but they are quite difficult to tape, so we modified with regular LED’s. Setting the basic rules: Lithium batteries need to be recycled (and don’t eat them…), What is a circuit (relating to circles…) watch out for short circuits, polarity of LEDs. This circuit is very forgiving, the internal resistance of the coin cell (we used CR2032) means you don’t need a series resistor to limit current for the LEDs, and also means that short term short circuits don’t destroy the battery immediately or cause a fire! We set up a station to hand out materials at the circulation desk. Next time, I think I might divide it into several stations. The most time consuming part was letting them pick which LEDs to use. You could either limit it to one kind, or spread it out a little. You could have people just pick them from bins on the table, but sometimes people take too many. (It wasn’t a problem here….) My son’s Mason and Grant assisted me both in preparing and in debugging people’s circuits, and were indispensable. 25 Kids with about 80% of them needing help would be too much for one person. One of the mothers came up with a good way of making the connections more reliable add copper tape under the leads of the LEDs as well as on top. One of the book racks made a nice display for the finished work. Instant Party for Arduino Day! You Do It Electronics in Needham asked me to help out with their Arduino Day celebration on Saturday March 29, and I wanted to make a nice Arduino demo that uses parts that they sell, relatively simple, and Fun! You Do It also sells DJ and disco equipment, so I thought what would be better than Arduino controlled Disco lights and Music? First, we need to find out what pins are in use in the MP3 Shield so we can figure out where to hook up the motion sensor and power switch tail. Digital Pins 5 and 10, and Analog Pins A0-5 are all free. I used the analog lines because they are close to the power and ground pins for both the power switch tail and the PIR motion sensor. Because the PIR output is open collector, I use the internal pullups on the Arduino. 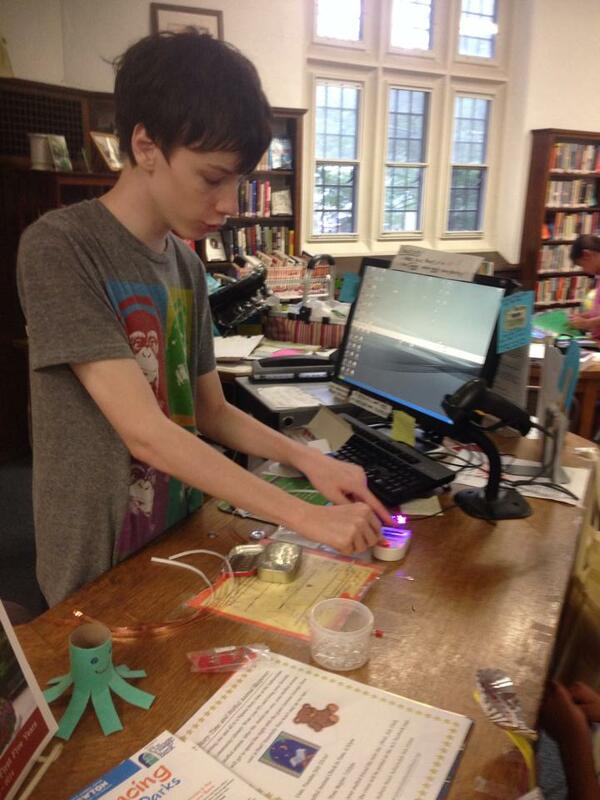 I did a couple of EL wire workshops at the Newton Free Library yesterday. It was a great time, and I think everyone left quite happy. Here’s how I prepared, and what we learned during the workshop. I ordered 55 Units that each had 3M of elwire, prewired, and a control unit that runs off of two AA batteries. I got them from an ebay seller (Sure Electronics) in order to get a good price. You can also buy them from domestic sellers like Sparkfun, but they end up being about 2x the cost. It’s good if you can talk to the Seller, as Sure told me that they sold two types, a less expensive one that was dimmer and a more expensive one that is brighter. I’m not entirely sure which one I got! The different colors were definitely different brightness , with Greenish yellow being the brightest, and red/pink being quite dim in roomlight. 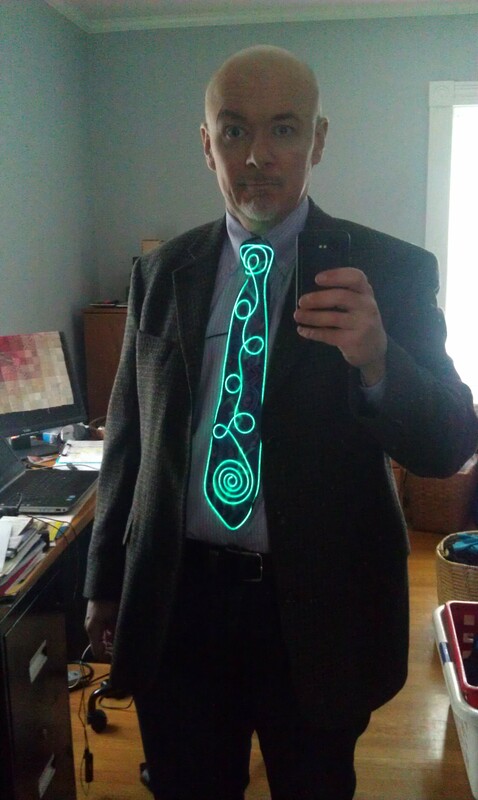 I wanted to create an example, so I sewed a segment onto a tie. Figure out where you want the battery pack to go. Start your layout from the battery end. It’s easy to cut off the other end (and safe) but it’s hard (but not impossible) to reconnect wires to the driver end. You can either attach as you go. or tape down your design. 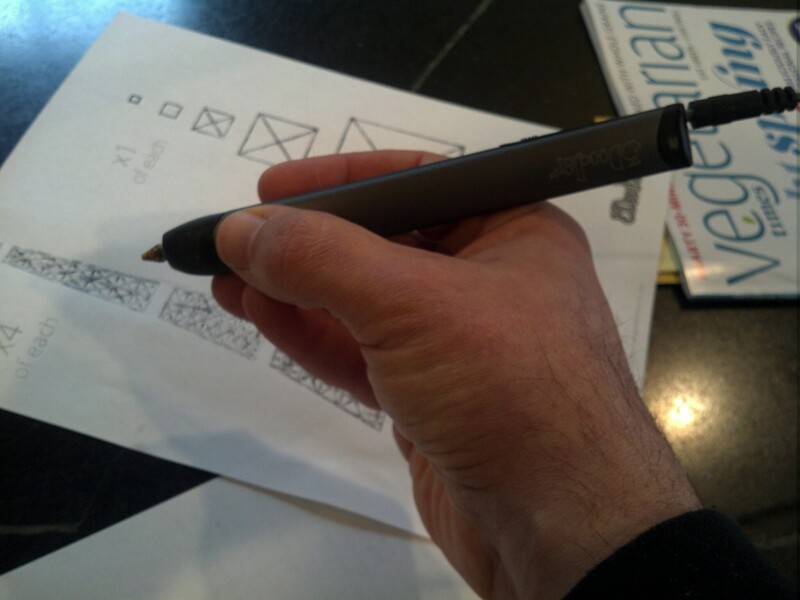 Most people felt that this created a more fluid design, but may make it difficult to properly lay out a complex design. Tape. One kid used a type of very sticky first aid tape to tape his design (the Pi sign in the gallery below) to the back of his shirt. It made a really conforming design with a flat background. This wouldn’t look very good on the front of the shirt. Sewing. This is the most invisible and elegant, but also the slowest and most work. If you use transparent thread, it’s even more invisible, but you’ll need to know your fisherman’s knots. 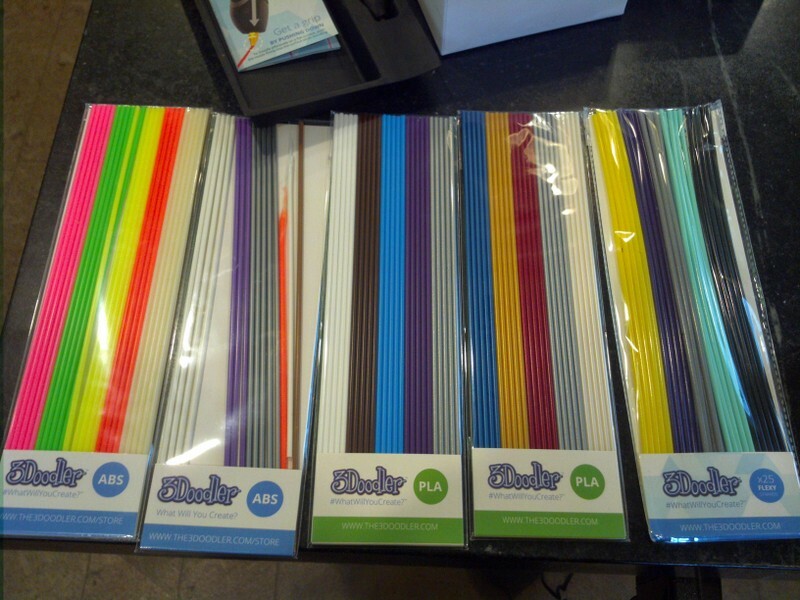 Cable Ties: This is useful for attaching to, say a bike frame, or other tubular structure. Last, make sure you turn off the lights at the end! We also had a dark closet available to test before we turned off the lights! 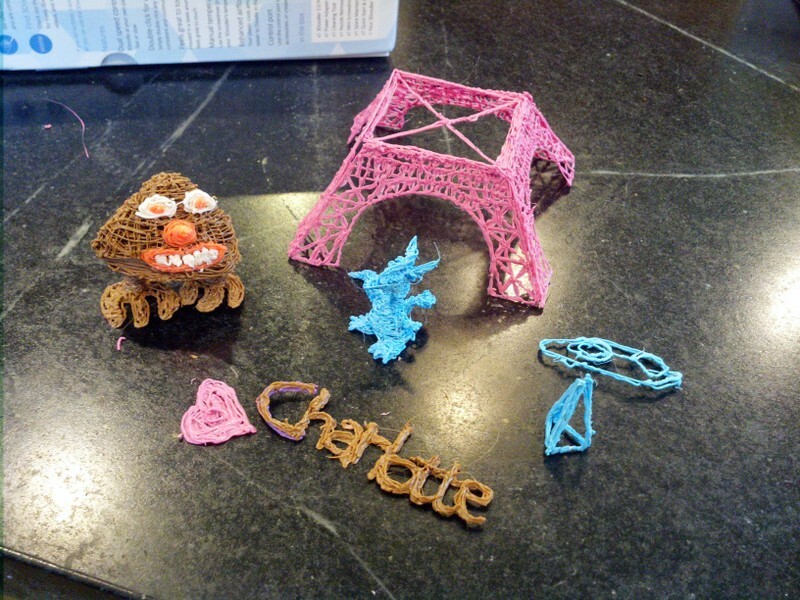 Here are some examples of the creations the kids made. Electrify Your Halloween! Making it Move! In late September, I led a workshop at the Duxbury Free library on making interactive Halloween displays, and more recently I set my project up on our porch for Halloween. One of the most effective ways to make your front porch scary and immersive is to pay attention to sound, and to make things move. The first part (making it scream) was documented in this post. This is about the movement part, creating a pop-up inflatable ghost, completely from scratch. It was very successful and popular!with the kids. Unfortunately I didn’t get any video, but I can cover the construction. I like inflatables, and wanted to try making my own. One thing that made this really easy was a really cool product called Powerswitch Tail. This allows you to control an AC outlet from a digital signal. 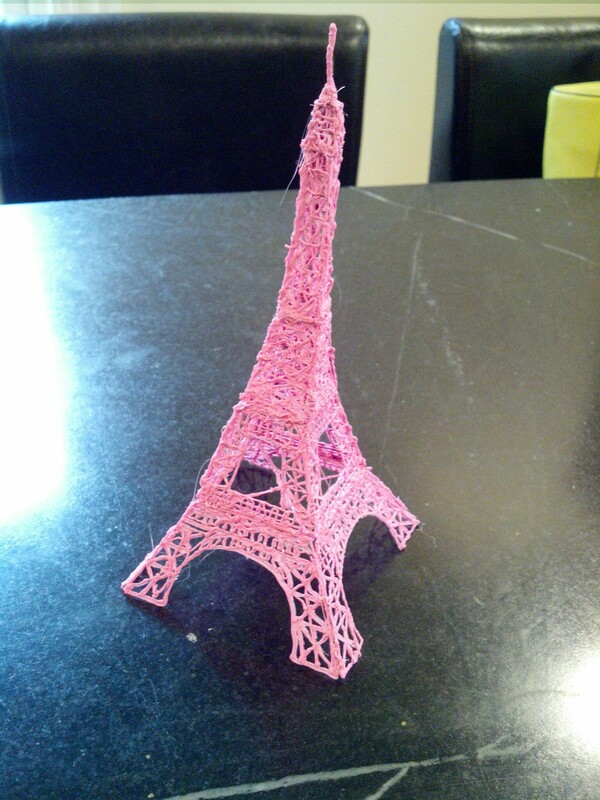 Its available from Adafruit and Makershed. It’s essentially a short extension cord with an opto-isolated relay in line. This eliminates any dangerous AC wiring with relays, and protects your Arduino and other circuits as well. Next I needed to make the Ghost. I use white kitchen trashbags at home, and I took three of them, two laid end to end (with the end of one cut off.) I cut the third bag in in thirds and used the outside sections for arms. I used simple transparent packing tape to bond the edges. I used one of those small vortex fans, and taped it around the output side. Boo! Attached to the fan, and inflated. 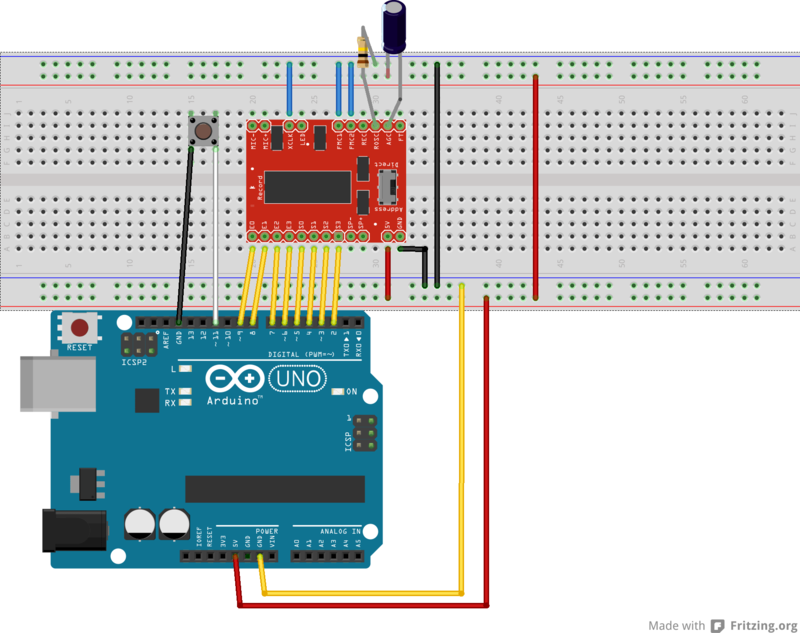 Hook the powerswitch tail to a digital IO on an Arduino and you are good to go. As I mentioned in the last post, you can get the code on github here. Electrify your Halloween! Making things scream! In this post, I’ll cover making sound, the next post will cover my moving ghost. There are lots of ways to make sound by control, and in reaction to people coming on to your porch. My original idea was to use a motion sensor, and then trigger an AC relay to turn on a cassette boombox. Because the boombox could have the mechanical play button pressed with the power off, when you turned the power on, it would play. This breakout is for a chip that was originally meant for a voice recorder with some buttons to trigger the different segments. It’s not very well documented on the sparkfun site, but one of the comments pointed me to http://ianlangelectronic.webeden.co.uk/#/voice-recorder/4562321245. That with the datasheet, let me build a simple Arduino library to control it. You can download it from github here. In order to make it more reliable, I mounted it on a protoshield. I also like using a proto-screw-shield to hook up the external components. In this case, the motion sensor (https://www.sparkfun.com/products/8630) on the right, and the wire going off to the left connects to a powerswitch tail to control a fan for the ghost. I used PC speakers connected directly to the jack on the sparkfun voice module. You can find the code on github here. You can control it via the serial port by entering a message number (0-8) and then ‘r’ or ‘p’ for record or play. It uses the onboard microphone for recording. I chose to use the button on the protoscrew shield as an arming button, but you can also control that through the serial port. ‘m’ toggles whether or not motion activates the sound and PowerSwitch tail output.